...or is it Fake News? 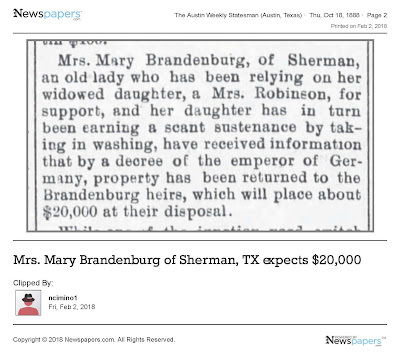 Newspaper research can reveal some of the most fascinating stories about our ancestors and their descendants. And so it is with one of my wife's ancestors, Mathias Brandenburg. 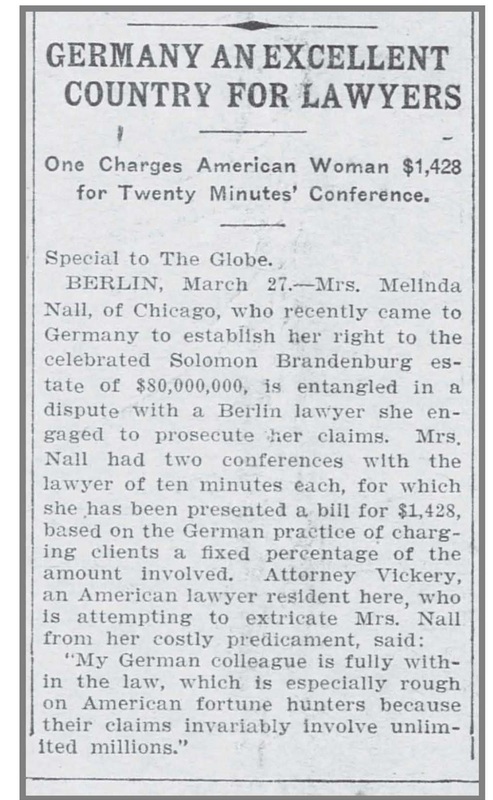 The legend of Mathias Brandenburg has become larger than life thanks to a lot of publicity that appears to have begun in 1888 and continued into the 20th century. Some of that legend has been interwoven with facts to give authenticity to a bit of "Fake News." Matthias Brandenburgh was born in the Palace in Berlin, Brandenburg, Prussia about 1738. His brother Solomon witnessed his birth. Matthias (Tice) and his brothers were members of the Hohenzollerns, the ruling family of Prussia and Germany, his grandfather Alfred being a half first cousin to Friedrich the Great of Prussia (1712-1786). Matthias’ great grandfather was "The Great Elector", Friedrich William of Brandenburg (1620-1688). 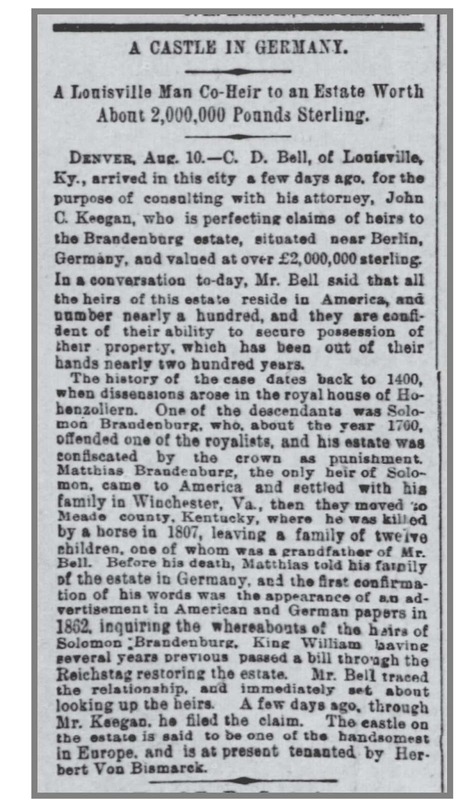 "told his family of the estate in Germany, and the first confirmation of his words was the appearance of an advertisement in American and German papers in 1862, inquiring the whereabouts of the heirs of Solomon Brandenburg, King William having several years previous passed a bill through the Reichstag restoring the estate." Mr. C.D. Bell claims to have traced the relationship and immediately set about looking up the heirs. "The castle on the estate is said to be one of the handsomest in Europe and is at present tenanted by Herbert Von Bismarck." 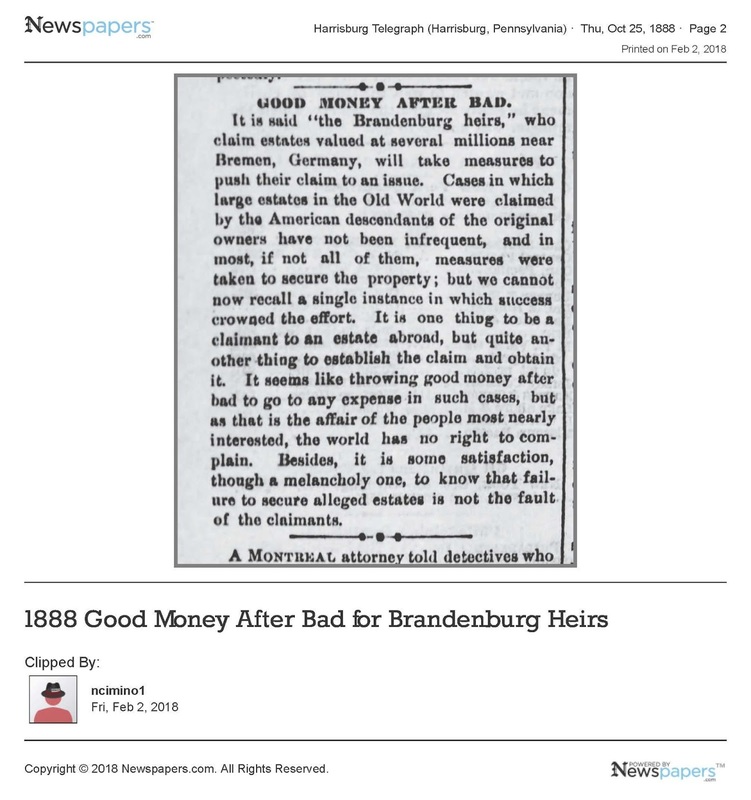 Curiously, none of the 1862 newspaper advertisements have been found nor has the bill that supposedly passed the Reichstag been found. But that did not stop dozens of newspapers across the United States from publishing these spurious accounts of an estate with one of the finest castles in Germany. C.D. Bell appears to have been a master of publicity. 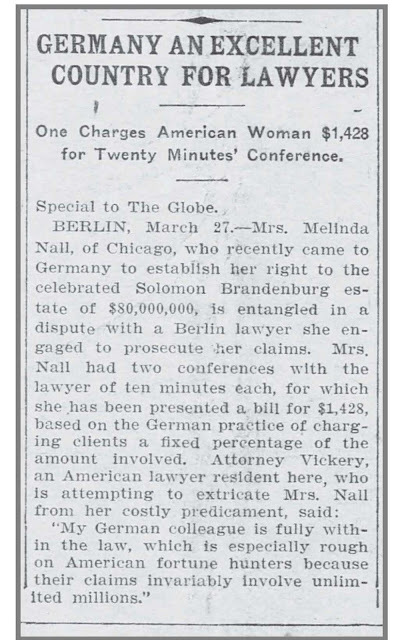 Finally one of these newspaper editors starts to be suspicious that perhaps a fraud is being perpetrated. But that did not stop many other editors from publishing more delusions. 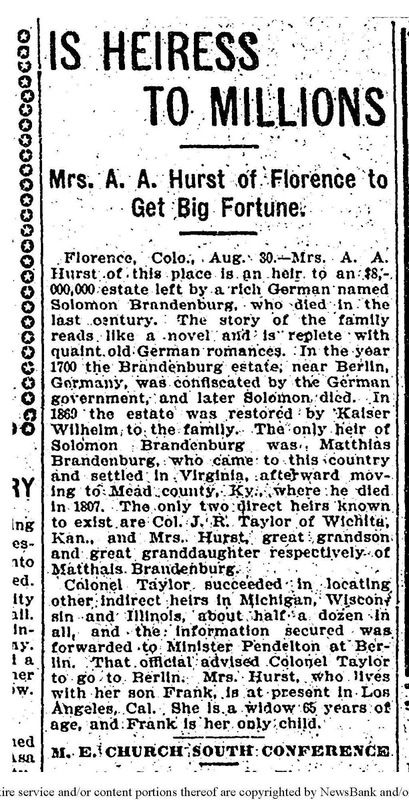 The article above may even have some genealogical value as it lists a number of heirs that are laying claim to the "enormous estate"
Finally another skeptic but more articles appear in 1889. The above article made me smile when Mr. J.W. 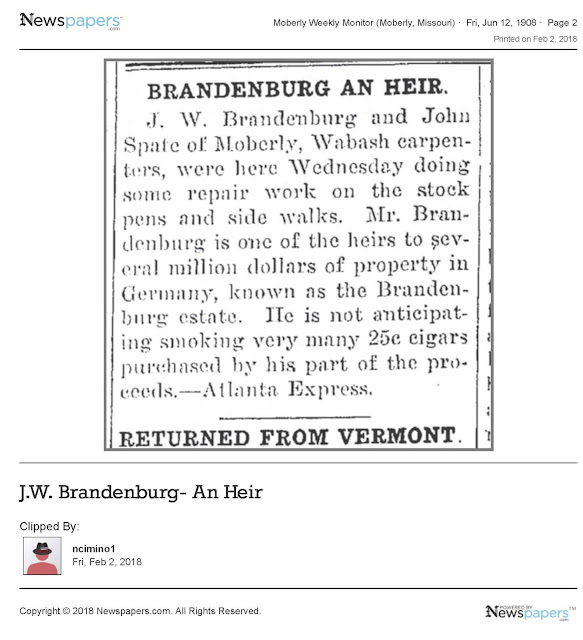 Brandenburg acknowledges that "he is not anticipating smoking very many 25 cent cigars purchased by his part of the proceeds." Matthias Brandenburgh probably first met his future bride, Hester Walgamot (whose family lived near Hagerstown, Maryland Colony, Frederick County [might have been Prince George’s County at that time]) about 1756 when the people who lived in her area were evacuated to the newly erected fort at Frederick, during the French and Indian War (1755-1763). Matthias Brandenburgh and Hester Walgamot were married about 1764 and settled in Frederick County, Maryland. Here their first five children, Henry, Joseph, Elizabeth, David and Nancy, were born. In 1767, two to three years after they married, Matthias leased a ½ acre lot in Middletown, Frederick County, Maryland, located between Hagerstown and Frederick; the lease was sold 5-1/2 years later. A trickle of German and Scotch-Irish settlers had been defying government regulations and braving Indian attacks for nearly fifty years to settle the fertile Appalachian Ridge and Valley Region in the back country of Virginia Colony. The region had been a joint hunting ground for several groups of Indians, none of whom actually lived there, (the same was said of the region now known as Kentucky). When these Indians signed treaties in 1768 "giving up" their rights to the land, settlers rushed in to take possession. Two years (1774) after selling the lease on the Middletown lot Matthias leased 210-1/2 acres of previously leased land in Patterson’s Creek Manor in Virginia Colony, Hampshire County (now West Virginia, Mineral County) about 50 miles southwest and across the Potomac River from Hagerstown. Matthias and Hester’s son Samuel was born after their move to the land in Patterson’s Creek Manor (1774). The remainder of their children, Jonathan, Solomon, John, Sarah, Catherine, Absolom, Hester and Ruth, were all born in Hampshire County, Virginia. The land had probably already been cleared of native trees such as pine, white oak, walnut and elm. Matthias’ lease required that he build a house at least 20’X16’ with a stone or brick fireplace and plant and raise 100 apple trees, at least 30’ apart. 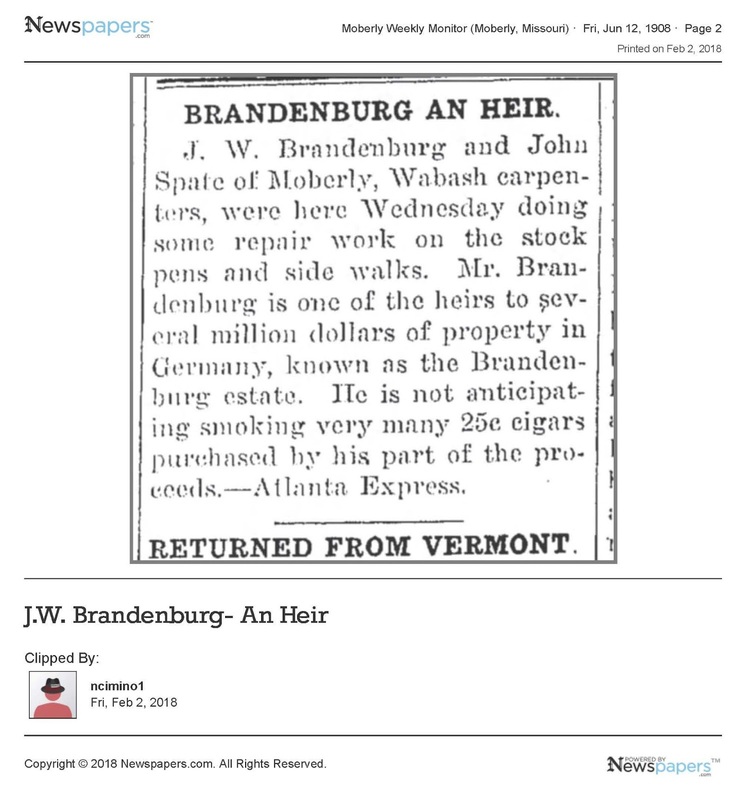 At the same time Matthias, Hester and their six children were starting the orchard in Hampshire County there were Brandenburghs in the first permanent settlements of the part of Virginia that was to become the state of Kentucky. 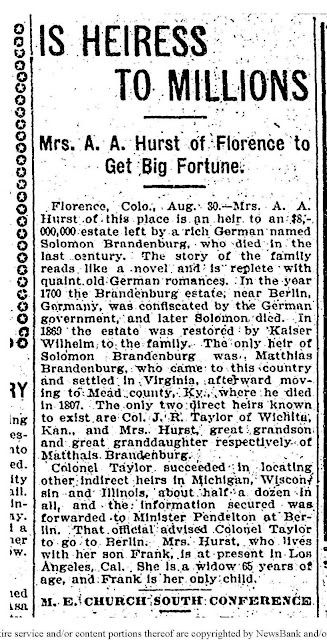 (Note: Christopher Stoffel Brandenburgh lived at Quicks Run, Lewis Co, Kentucky and died there in 1802. His daughter Catherine married Charles Shepherd and Susanna married William Carr, both marrying in 1802 in Mason County, Kentucky. A deed was made to Catherine Brandenburgh in 1832. (Note: B. A. Deatrick stated in his research "There is a painting in the Washington University Gallery of Art in St. Louis, Missouri, painted in 1851-1852 (76 years after the fact) by Caleb Bingham. It shows Daniel Boone and his wife, the first white woman to settle in Kentucky, his daughter and several other people on the Warrior's Path (which became the Wilderness Road) as they were passing through the Cumberland Gap in 1775. To Boone's left (or right when the picture is printed in reverse) is David Brandenburgh- - I failed to document where I got that last information ! Daniel Boone doesn't look much like contemporary drawings of him and David Brandenburgh may or may not have been painted from first hand descriptions." . . .It has been said that this was Matthias' son and that Absalom, another son of Matthias, was also one of Boone's scouts. Matthias' son David was about four years old in 1775 and Absalom hadn't been born. "At the Court held for Hampshire County, Virginia the 12th day of August, 1783, Matthias Brandenburgh for 1 Blanket - 4.1 pound payment." This Service was marked for Contructal [Continental] soldiers. It looks as though Matthias contributed his blanket (nicer than the others) to the militia rather than to the United States Continental Army. This blanket was one of many contributions made to the militia in September, 1778. (B. A. Deatrick wrote in his research notes: "That blanket has been sufficient for several Brandenburg women to join the Daughters of the American Revolution and at least one man to join the Sons of the American Revolution.) On this record Matthias Brandenburgh was made a DAR Patriot. 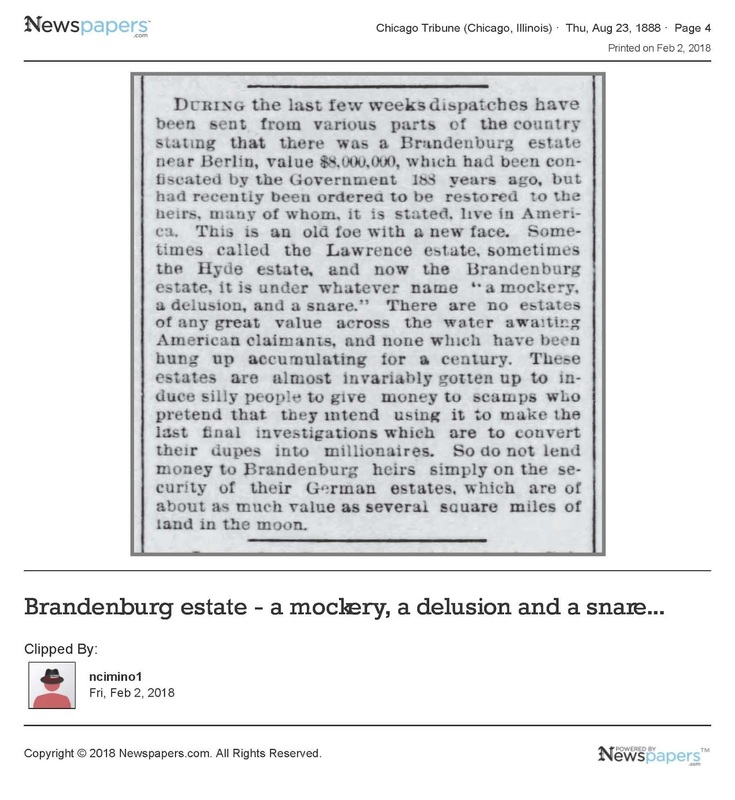 ....Brandenburgh data from research by F. Nelson. The reference for this is given as "Deed 4, pg. 141 Hampshire Co. Va." and "Virginia State Library claims for services." "Matthias, on October 16, 1787, was the lessor of 48-1/2 acres on Patterson Creek in Hampshire Co, VA. It is also noted that on November 24 1789, Matthias Brandenburgh (wife Hester) of Hampshire County authorized Issac Good with the Power of Attorney of collect in lawful manner anything due the said Brandenburgh. It appears that Matthias stayed there through the 1780's. Matthias’ oldest son Henry was taxed for years 1784 thru 1787, but did not appear on the 1788 Tax List and it is believed that Henry Brandenburgh was exploring the land to the west, Kentucky and the Boonesborough area in particular. Henry may have sent word for his family to join him or he may have returned to guide them and help in the move. Matthias’ home in Hampshire Co, Virginia was about six miles from Cumberland, Maryland; and Matthias’ family and Henry no doubt followed the trail that later became the Cumberland Road, America’s first National Turnpike. (The Cumberland Gap was between Virginia and Tennessee.) "The route through western Pennsylvania was long and tedious requiring up to three months." The Maryland State Road ran from Baltimore, through Frederick and Hagerstown to Cumberland, from there a trail ran south of Pittsburgh, Pennsylvania and on to the Ohio River where people with their wagons, belongings and animals could be rafted or carried on flatboats to Kentucky. (Steamboats were introduced to the Ohio river about 1810 and flatboats continued to be used. "In 1846 more than 2,000 flatboats sailed down the river to New Orleans. But by the 1860 they had all but disappeared.") The Cumberland Road followed the trail in the early 1800s and was macadamized all the way to the Ohio River by 1811. From there it continued across Indiana into Illinois where it was finished about 1850. It is now U.S. Highway 40." 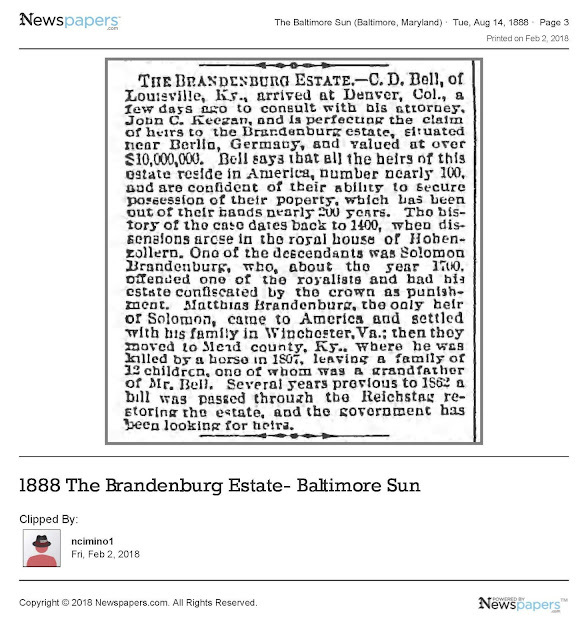 "It has been said that the Brandenburghs first went to Mason County, Kentucky and that probably was where they landed to begin the journey inland, but the records indicate that they went directly to Fayette/Clark County. Although Matthias had been in Fayette County, Kentucky since 1790-91, it wasn’t until the autumn of 1798 that Matthias bought 150 acres on DeWitt’s/Jouett’s Creek. The creek empties into the Kentucky River and is located southeast of Winchester, Kentucky. (Mr. Bell, in his bid for the Brandenburgh estate, said Matthias lived in Winchester, Virginia. This caused some researchers to look at present-day Winchester, Virginia instead of present-day Winchester, Kentucky. Per B. A. Deatrick)." "The land was purchased from John Holder, who had a boat yard not far away on the Amsta Grove Road ("Land of Our Fathers"). Holder had been captain of a company of soldiers that had defended the fort at Boonesborough from Indian attacks. He attested to the 1796 marriage of Matthias’ son Joseph to Delilah Vesser; she and her mother had once taken refuge in the fort." Matthias and Hester moved and settled at the mouth of Duets Creek below Ford Station on the Kentucky River in Clark County, Kentucky about 1790. 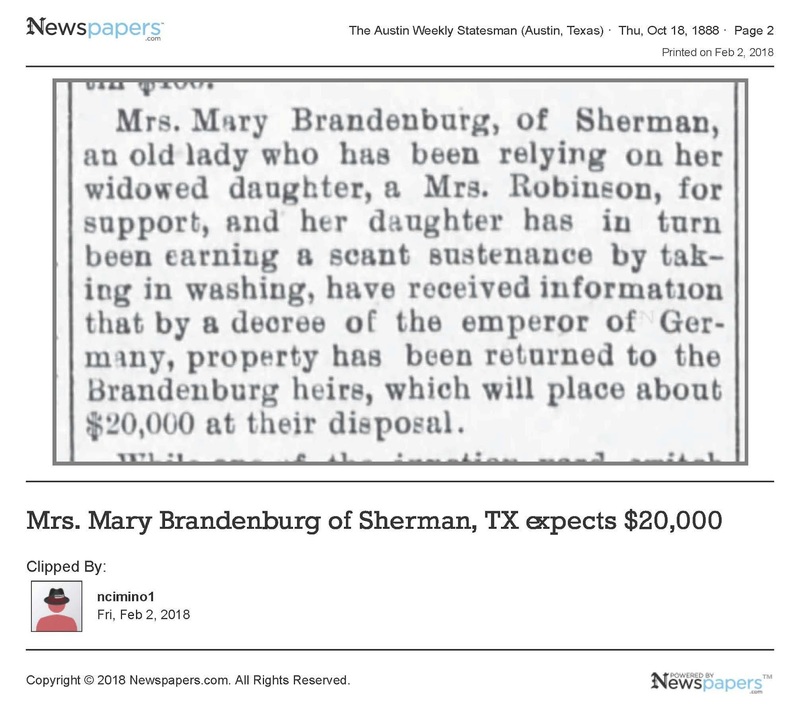 There were 150 acres in his home place, and the records indicate that this family were later to become large land owners. 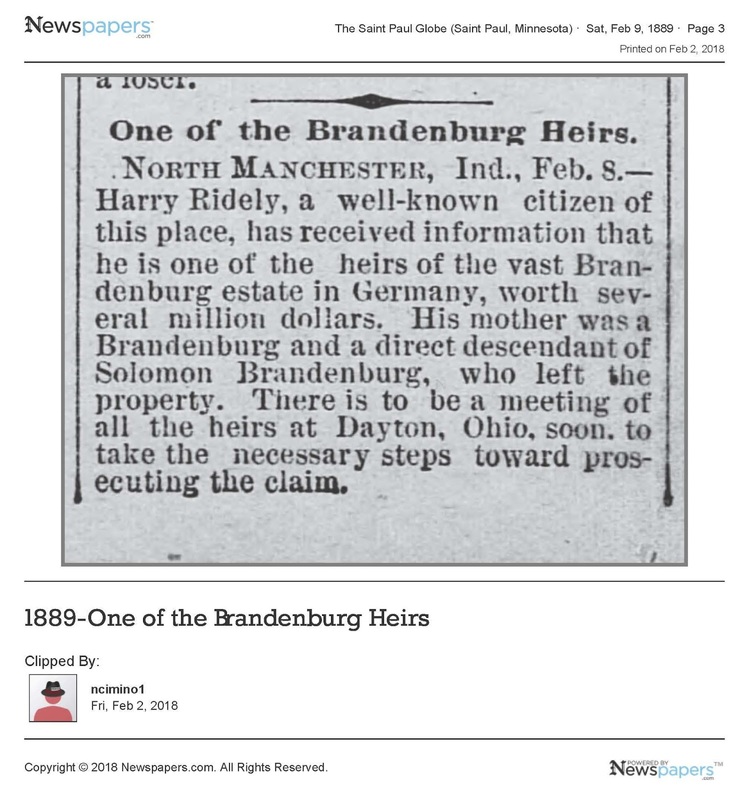 Some members of the family settled at Heidelberg, now in Lee County. Others migrated farther west, locating in Meade County, where the County Seat of Brandenburg received its name from the original settlers, mainly Solomon Brandenburgh, Matthias' son, who owned and operated the ferry. Matthias is missing from the Clark County records for two or three years, beginning in 1798 or 1799 and it is likely that he and Hester were in Hardin County with his children; his son Jonathan and his daughter, Sarah Brandenburgh Vertrees, was there as well. 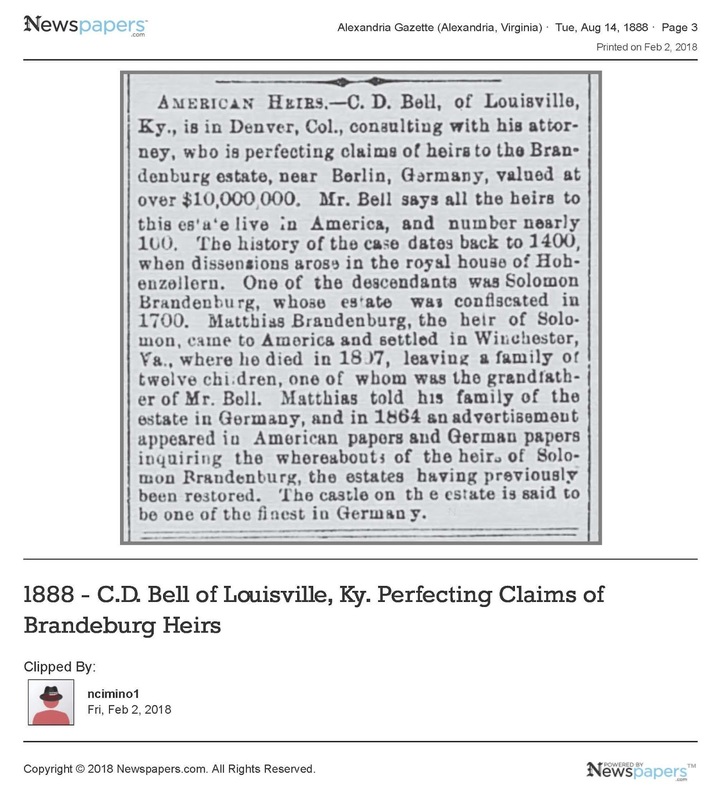 In 1804 Matthias transferred by deed the farm in Clark County to his son Samuel; then in 1805 he moved to Crab Orchard, in Lincoln Co, Kentucky. 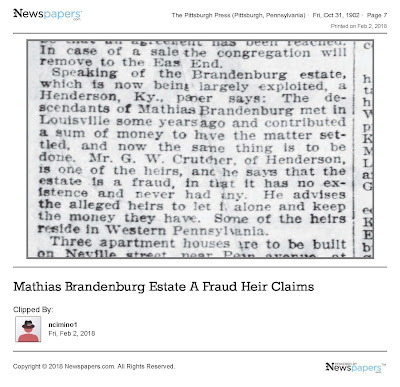 Matthias Brandenburgh and all his children spelled their names using the "burgh" ending. This continued until after the 1850s. Some time before his death, Matthias revealed to his family that he was a member of the Royal Family of Brandenburg, Prussia (The House of Hohenzollern). He told them that he and his brothers had left a vast estate in Prussia, the reason being, "a Catholic procession was passing through the streets of the city of Berlin, this procession headed by a distinguished Loyalist who stood in high favor with the reigning Prince of Brandenburg, who was himself a Catholic. (During the reign of Frederick I (1701-1740) and his son, Frederick II The Great (1740-1763)). It was expected and commanded that every man whom this procession passed should take off his hat in token of honor to the great personage, who in glittering regalia rode at the head of the procession. Two of his brothers (one being Solomon) stood watching the procession. Even though the brothers were near relatives of the reigning Prince Catholic Elector of Brandenburg (Frederick the Great) they were Protestants and they not only refused to take off their hats to a Catholic dignitary, but they even spoke contemptuously of him. this was reported to their relatives. The King and Elector of Brandenburg (Prussia) was angered by their action and sent forth an edict confiscating their estate. This act was followed by persecution and fear of loosing their heads, and the brothers fled to Holland and then sailed to America, never regaining their possessions or estate in the Province of Brandenburg. Matthias' will was probated 21 March 1807, book 2, pg. 240, Brandenburg, Meade County, Kentucky. David Brandenburg, Matthias’ son, was named Administrator of the Estate. 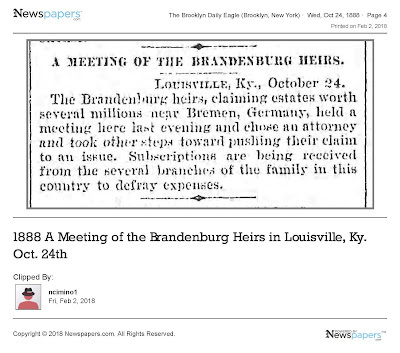 In 1822 "Power of Attorney" was given to David by the Brandenburghs living in Hardin County for him to sell Matthias’ land to Thomas C. Green, husband of Matthias’ daughter, Catherine. 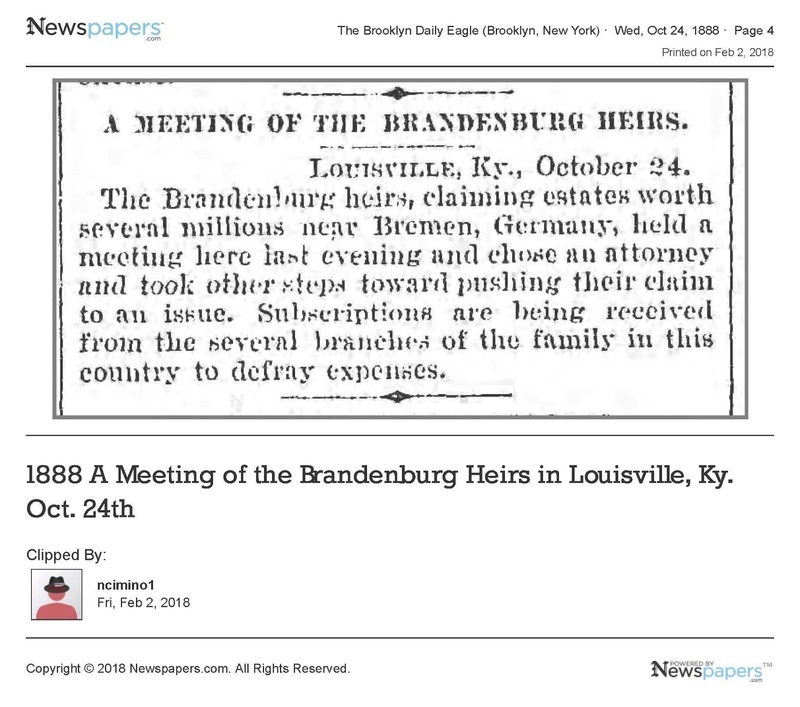 Descendants of Matthias Brandenburgh can be found throughout Kentucky, Ohio and Indiana, with a particularly dense concentration in the Kentucky counties of Clark, Estell, Lee, Owsley, Clay, Madison and Meade. 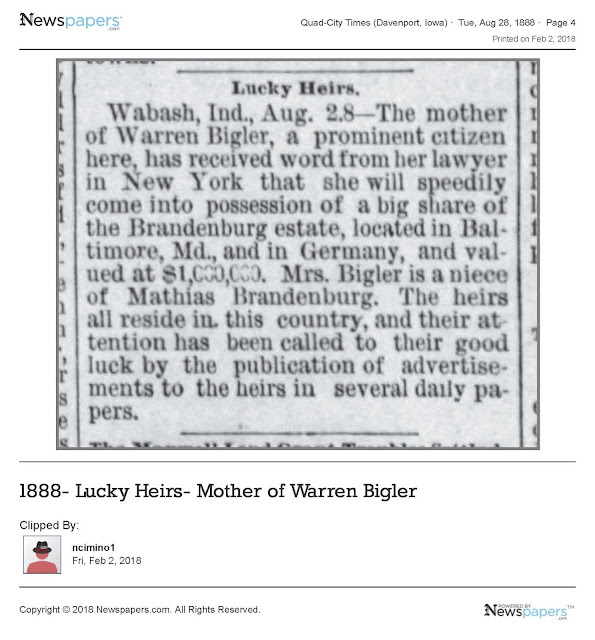 A large number of his descendants migrated to Ohio, where many settled in the counties of Warren and Butler. In reviewing this incomplete history of the Brandenburgh Family, it is revealed that they must have had a genuine admiration for Nature. They were all primarily farmers, with the possible exception of the latest generations. Court records show that they were land owners, and the number of transactions which they made in land indicate they were not adverse to investing in natural resources. They exhibited the restless spirit of the pioneer, migrating across the Alleghency Mountains and coming west by way of the Ohio River, and then settling along the tributaries of the Miami and Kentucky Rivers. Descendants of these early pioneers have since located throughout the entire country, with a dense concentration in the Middle West. It is also indicated that these early pioneers must have been students of the Bible, with a deep respect for their ancestors and solemn reverence for the Divinity. It is noted that most of them had Biblical given names, and that these names were perpetuated in the family by frequently giving children the same names as their parents and grandparents. (E.C. Brandenburg). -- Samuel Haycraft's History of Kentucky p. 162. -- Mathias' will in the Clark Co. KY records. --Brandenburg Family Folder, Kentucky Historical Society, Frankfort, KY.
--Who Was Who in Hardin County, KY. by the Hardin County Historical Society, Nov. 1944. 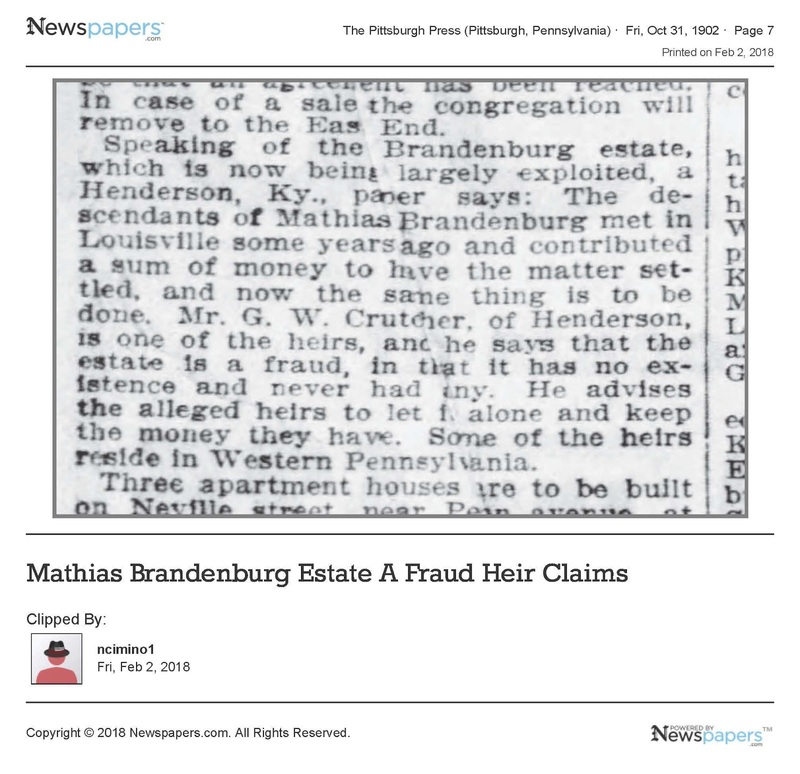 --Evelyn Parsons and Mary Quillen of Heidelberg, KY. descendants of Matthias Brandenburgh, supplied much valuable material without which much of the information pertaining to Matthias could not have been included. (Benjamin Franklin Brandenburg). John Frederick Brandenburg's book says Matthias is listed in the D.A.R. 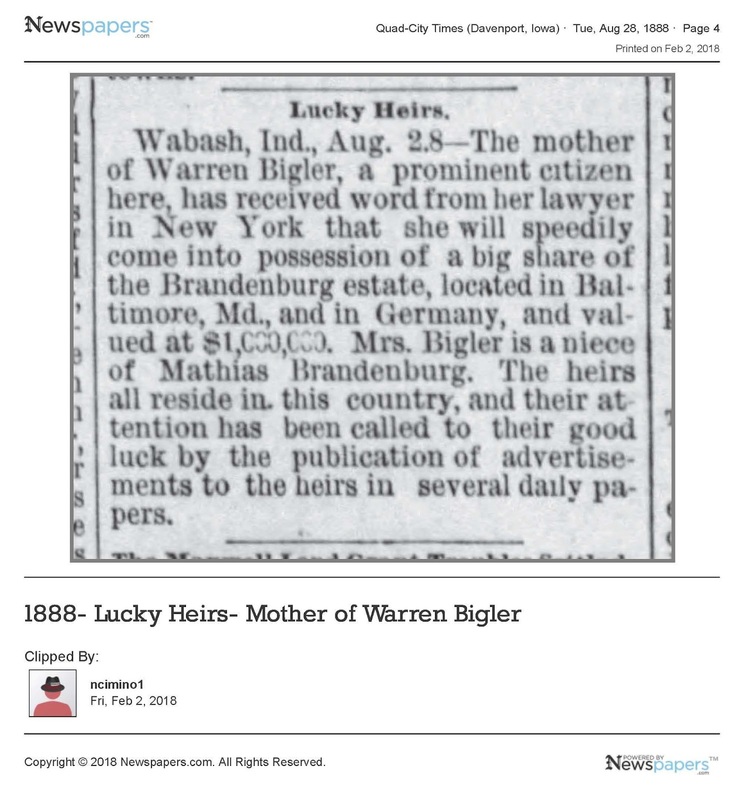 First shows up in America in Hampshire County, West Virginia in 1782; but prior records to that are in Frederick County, Maryland where Matthias first met Hester Walgamot and then married Hester in Frederick Co, MD. 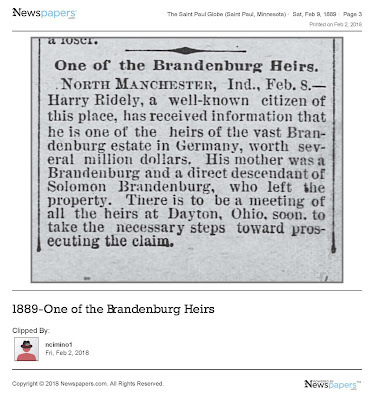 An unknown descendant stated "Sam Sargent, brother of the famous midwestern artist Paul Turner Sargent, gathered much of our ancestry on the Brandenburg side when I was only 15 years old. My uncle, Dwight Childress, and I were wiring country houses for electricity shortly after World War II. Sam and his English bride's house was one of those houses we wired. Sam did this as a hobby and he very generously did this for me. Take this for whatever it's worth. He writes, " The Brandenburg family in the United States originally came from Germany, being a branch of the famous and prominent House of Brandenburg of the Province of Brandenburg of Germany. Matthias Brandenburg was named "ELECTOR OF ESTATES" on June 12, 1758. Name: COLEMA01.GED. Submitted by Barry Ellis Coleman, 2515 E. Olive 4C, Arlington Hts, IL. 60004 (708) 870-8088. The truth about Mathias Brandenburg is that his descendants have been duped into thinking that they are heirs to a royal fortune. Do not let the fact that someone cites their sources fool you into believing everything that is said. There may be several facts interspersed with the lies. As genealogists, we need to do a better job of sorting fact from fiction.